A striking-looking biennial species with a long, dense spike of bright yellow, unstalked flowers and with large, lance-shaped and very hairy leaves on the lower part of the stem. It can reach about 4 ft (120 cm) or more in height. 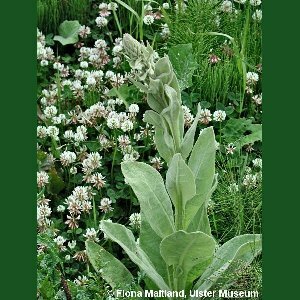 It is a plant of somewhat unpredictable occurrence, suddenly appearing unexpectedly from dormant seed in waste ground or in garden flower beds and disappearing equally suddenly. 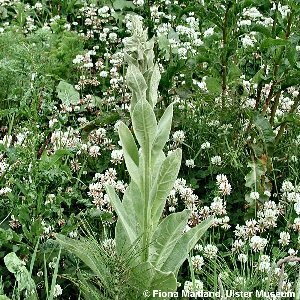 Other verbascums (all aliens) occasionally occur as casuals but V. thapsus is the only one which is at all common in Northern Ireland. 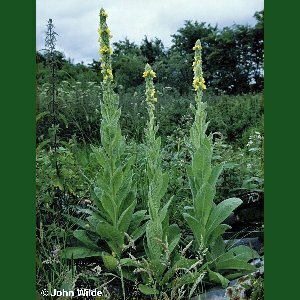 All names: Verbascum thapsus L.; Verbascum schraderi G.F.W.Mey.